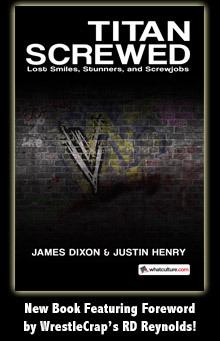 SOMEONE BOUGHT THIS: A Book of Poetry by the Authors of Pain - WrestleCrap - The Very Worst of Pro Wrestling! Nice to see Akam & Rezar living up to their name and actually writing a book. Pick it up here…for free! 6 Responses to "SOMEONE BOUGHT THIS: A Book of Poetry by the Authors of Pain"
This is great! I love all of the comments from the Amazon “customers” whose usernames all seemed very familiar. Hmmm? If I drive around with it, is it not poetry in motion. Coincidentally, Terry Taylor is writing a similarly themed book entitled, Poultry in Motion. If I’ll buy Any book of poetry written by a WWE Superstar (free or not) it had better be from the scrolls (or Frisbees) of Lanny Poffo, thank you. A rather genius selection you made. Guest Induction: Shawn Michaels vs. Kurt Angle – If the rasslin’ business ain’t broke, keep fixing it!